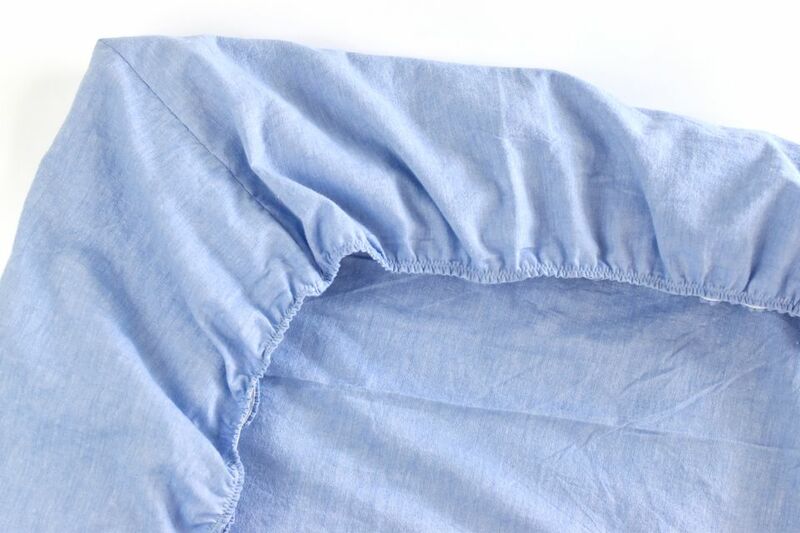 A fitted sheet, or "bottom sheet" as it's often called, may be incredibly difficult to fold, but they're easy to sew. They also make beds look smooth and inviting. This simple pattern for making your own fitted sheets provides you with lots of bedding options. When you sew your own fitted sheets, you can repurpose sheets or duvet covers in the wrong size, or buy fabric to customize bedding to match your decor. And since mattresses come in different depths, making your own gives you control over the fit. The process is as simple as sewing a few corner darts and then adding elastic to hold those sheets in place! In addition to fabric, you also need 4-8 yards of 1/4-inch wide elastic, rotary cutter, ruler, cutting mat, pins, and sewing machine. For the best fit possible, measure your mattress before you start. Mattress sizes may have standard guidelines, but they do vary, especially when it comes to depth. Measure the width, length, and depth of the bed. Multiply the depth x 2, add the width, and then add 6" which allows 3" to tuck under the mattress on each side. Multiply the depth x 2, add the length, and then add 6" for wrapping under. Cut the fabric to the dimensions you need for your sheet. ​Use a rotary cutter, ruler, and mat for accurate cutting. Add the depth of the mattress to the 3" for wrapping. Use this measurement to cut a square from each corner of the fabric. With right sides together, pin and sew the two edges together at the corners. Finish the seam with a zig-zag stitch or a serger. Alternately, you can sew a french seam for a beautiful finish. Prepare to hem the edges of the sheet by turning and pressing under 1/4" and 1/4" again. You can stitch this in place if you want to add elastic only at the corners. However, when you sew elastic all the way around the sheet, it isn't necessary to pre-sew the hem. Use a zig-zag stitch to attach the elastic to the edge of the sheet, overlapping the inside fold of the hem. Be sure to use backstitch at the beginning to secure the end, then stretch the elastic as you sew. Make your way around the entire sheet. When you reach the start, overlap the end and backstitch again. Trim the excess elastic. If you prefer to only have elastic at the corners of the sheet, cut 4 10-inch pieces of elastic. Center each piece of elastic at bottom of each dart on the wrong side of the sheet. Stretch each end of elastic as far as it will go along the edge of the sheet. Use a zig-zag stitch to attach the elastic to the corners of the sheet, keeping the elastic stretched so that it will pull in the sides. Repeat on all four corners. Tip: Pulling the elastic can put stress on the needle and thread. If you find that the thread is breaking, make sure you have a large enough needle without any spurs and that you're using good quality thread. When the elastic is attached to the edge of the sheet and it's no longer stretched, it should have a gather to it like you see here. Having this all around the sheet helps hold things in place nicely! Now that your sheet is finished, make your bed with your new homemade fitted sheet! Fitted sheets often come extra-deep to accommodate different mattress depths. You can do the same thing when making your sheets, which is helpful if you plan on using them on different beds. Need a flat sheet to match? Cut your fabric to the same size as the flat sheet and then hem the edges!